Komodo National Park offers some of Indonesia’s best scuba diving, from the temperate waters of the south to the tropical reefs of the north – in November 2009 I took a 10 day trip on MSY Damai to explore this amazing area for a third time. I’ve dived Komodo twice before – in December 2006 on the Peter Hughes’ boat Paradise Dancer (about which I wrote this Komodo Diving article for Scuba Diver AustralAsia magazine) and then in September 2008 on S/Y Siren. (I wrote this Diving Komodo story for EZ Dive magazine and also wrote up a S/Y Siren Liveaboard Review). In November 2009, I went back to Komodo for a third time on MSY Damai, Indonesia’s newest liveaboard. I’ve already written up a comprehensive MSY Damai Liveaboard Review, complete with videos and photos of the cabins and critique of how the ship operates – this trip report will focus on Komodo as a diving destination. Even though this was my third trip (or perhaps because it was my third trip) I am not tired of Komodo – indeed, I would go back there in a heartbeat, and will definitely be looking for an opportunity to dive there again in 2010. With each trip I’ve done there I’ve enjoyed Komodo’s sites more and more – a typical liveaboard passes through such a large area that it’s quite overwhelming (in a good way) each time you do it. Our trip began with early morning pickups from Bali hotels for our domestic flight from Bali to Labauan Bajo. We met up at Starbucks and all our check in formalities and checked baggage was dealt with by MSY Damai representatives, so there was very little for us to organise. Once at Labuan Bajo, we were met by Lorenzo, Damai’s Cruise Director and several of the Damai team to take all the luggage into three aircon taxis before the 20 minute drive to the port. Once on board MSY Damai, there were welcome drinks and snacks and a tour of the boat. (See my in depth liveaboard review of MSY Damai for more info about cabins, food, diving setup etc). 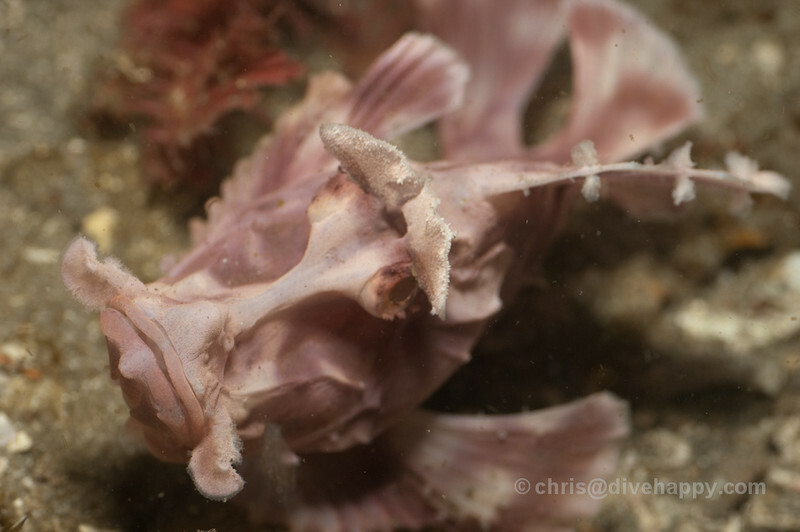 We did a check out dive that afternoon at Wainilu, a shallow muck dive that turned up quite a few critters and gave everyone’s cameras a workout. Besides juvenile batfish,juvenile sweetlips, barramundi and mantis shrimp, the most fascinating discovery on the dive was a giant Melibe nudibranch, which used the most bizarre hoover action on the sand to find its dinner. (See my post Attack Of The Giant Hoover Walrus Nudibranch for pictures and more info). The evening dive at the same location served up not only mating mandarin fish but also mating dragonets, a first for many people on the boat. Unfortunately I didn’t get any decent shots of either, but it was great to see them. The day began early, setting out at 6am to head onto the island of Rinca and see the famous, fearsome Komodo Dragons. The dragons are only found in the wild on three islands in the world – Komodo itself, Rinca, Flores and Gili Motang. Having been to both Komodo and Rinca to see the Dragons, I think Rinca is actually the better experience – you have a much better chance of seeing Dragons out in the wild, rather than just the ones that hang around the ranger huts waiting for scraps of food. (You can read my report of spending time with the Dragons on Komodo on my other site Travelhappy). Of course, the fact they’re at the ranger huts means that you get to see a Komodo Dragon within about 5 minutes of stepping onto the island, so there is a certain instant gratification. On Rinca, there is a long and short walk – we did the long walk (around 6km and 2 to 3 hours) which took a couple of hours as the morning sun got higher and higher and hotter and hotter. We were rewarded though with numerous wildlife sightings – water buffalo, monkeys, birds etc – and several close encounters with Komodo Dragons. Our group actually wound up being pursued by a Dragon down a driedup river bed, so there were a couple of moments where we had to move fast and the guide had to employ his hefty stick to fend off the overly curious Dragon. After lunch, we did two dives at Tatawa Besar, on the island on Pandar – while this morning had been adrenaline and exertion, this was the complete opposite – a stunning reef, with its clumps of soft coral lit up in saturated colours due to the bright early afternoon sun overhead. With the deep, vibrant blue of the water, and clouds and clouds of fish everywhere throughout our time underwater despite the lack of current, there were no complaints about doing a second dive on the same site. The night dive was at on the sandy slope of Bus Stop, where the highlights included encounters with starry night octopus and tiny bobtail squid. Overnight we had sailed from Pandar down to what I think is one of Indonesia’s most desolate and beautiful locations, Horseshoe Bay. The Bay lies at the very bottom of Rinca and is home to several of Komodo’s iconic dive sites, along with a local population of Komodo Dragons that wander along the otherwise appealing sandy beach. There’s no rangers here to keep you out of trouble. We were to be at anchor in Horseshoe Bay for two days and so could basically dive as we wished around the standard 4 dive schedule. First up was the legendary Cannibal Rock, a big seamount just under the water that was so named due to two Dragons being spotted on the beach attacking each other. The water in Horseshoe Bay is much colder than it is in the north of Komodo. The water tends to be 24 degrees Celsius and can drop even lower. As such, Cannibal Rock is usually green water, and quite murky, but the site itself is more than enough to make the discomfort worth it. The rock is a smorgasbord of soft corals, plate corals and crinoids, with vivid yellows and greens predominating, along with scores of stunning and usually rare creatures, from giant frogfish and oversize nudibranches to a golden yellow rhinopia, along with turtles, lionfish and mantis shrimp. It’s one of those sites that, especially for photographers, you just don’t know where to look first. We did a total of three dives on Cannibal Rock, including one night dive. Yellow Wall and Crinoid Canyon are located on opposite sides of Horseshoe Bay and similar topographically, near vertical drop offs that are covered in a spectacular carpet of soft corals and crinoids that tumble over one another. Up in the shallows particularly both of these sites shine, particularly as we had absolutely flat calm, sunny conditions on both days so the sunlight not only lit up the shallows but the wall above the waterline was also visible. (It worth noting that it’s not always sunny around Horseshoe Bay – the two previous times I’ve visited it’s been cloudy and rainy). Torpedo Alley was a dive that I was going to skip to catch up on some sleep… until I heard that the dive guides Gusti and Wayan had discovered not one but two rhinopias together. Rhinopias are extremely rare and also very difficult to find, so for two to be spotted together was a real coup. Both Gusti and Wayan are very experienced and I’ve dived with them on previous trips, and they were on great form throughout this trip too. This was also a good example of MSY Damai’s dive policy while at anchor – even though I had technically missed the dive and divers had already started coming back, Gusti encouraged me to gear up and for us to quickly head back out so I could see the rhinopias for myself. While I was taking pictures of them, Gusti somehow managed to find a tiny juvenile rhinopia, of which I only got a mediocre photo. Even so, it was great to see it and to have not missed out on seeing the adult rhinopias too. Torpedo Alley continued to turn up amazing surprises on the night dive, the highlight of which for me was seeing a Bobbitt Worm for the first time. These super scary-looking creatures are thankfully only a couple of inches long (at least, the part that appears above the sand) but their nightmarish appearance certainly makes you keep any appendages safely tucked away. And yes, it’s called the Bobbitt Worm after John Wayne Bobbitt. Ouch. From Horseshoe Bay we headed to Manta Alley, located at Tora Langkoi Bay. This is another must-see Komodo site where manta rays, probably the most graceful creature in the ocean, gather en masse in the current to feed on plankton. We did three stand out dives here and, while we thought it might be a case of diminishing returns, the third dive turned out to be the best. In the morning we’d encountered super strong currents that had pushed some of us back away from the channel where the mantas are usually seen – I was concerned I was going to miss out, until four manta rays passed straight over my head on the outcrop where we’d come to rest. It was the beginning of a magical dive where we saw mantas swoop and twist around us in all directions for the entire duration of our hour on the bottom. Every time we thought the show was over, the mantas would glide in from another, unexpected direction, sometimes three or four of them in a train, moving with perfect synchronicity behind one another until they spun back out into the blue. On our subsequent dives we made our way back up the channel where the current had reversed direction and was now pushing us in front of it, until we rounded the corner and nearly collided with no less than nine manta rays effortlessly hanging 3 deep in the underwater breeze. As we skidded off to the sides and underneath the mantas barely acknowledged our arrival and continued to remain perfectly still until they’d had their fill of plankton. On our third dive, the current had disappeared and we thought, with it, the mantas would be gone too. Yet they remained, with what seemed a great playfulness as they skimmed over the reef and over each of us as well, unperturbed by our bubbles or camera flashes. I spent the last half hour in less than five metres watching the mantas disappear and reappear within the now greying, turbid water as the day’s light began to fade. After 85 minutes, I reluctantly had to draw my dive to an end and exit while the mantas still spun around just below me. If there’s one dive site I already want to go back to in Komodo, it’s Manta Alley. Our arrival next day at Gili Lawa Laut and the dive sites of Castle Rock, Crystal Rock and Lighthouse was the most anticipated part of the trip for me. At Castle Rock last year, while on board S/Y Siren, I’d had two magical dives at Castle Rock that immediately went into My Top 10 Dives. (You can see a video shot at Castle Rock by my talented friend Ai Futaki too, along with her beautiful Freediving In Komodo video). I’d been wondering if my return visit could possibly be as good. We stayed two days at Gili Lawa Laut which gave us time to dive Castle Rock and Crystal Rock twice, both sites that need the tide tables consulted thoroughly as the current can be ripping. Our first dive was in almost slack water and so there was not quite as much fish action as I remembered from previous trips – however, the corals were resplendent and we spent a lot of time with two cuttlefish that were laying eggs in a large staghorn coral patch. At Crystal Rock we had giant napoleon wrasse action, the biggest I’ve ever seen, a good metre in length – and there was the beginning of a definite electricity across the reef with jacks and fusiliers stampeding around us, barely heeding the presence of divers. When we dropped back in at Castle Rock, it was stunning – sitting at 15 metres on the plateau of rock as it drops away into the blue is like being in the front seat of an aquatic IMAX screen. What had been quite quiet on the previous dive soon became a blue canvas filled with, no exaggeration, thousands upon thousands of fish – dogtooth tuna and whitetip sharks weaved in and out of fusiliers, jacks, snapper and a baitball of glassfish tens of metres deep and hundreds of thousands strong, moving as one across the backdrop of the sun illuminating the ocean. Indeed, perhaps the most amazing thing about Castle Rock is the way the whole dive site feels like it’s flooded with sunlight – the viz has been spectacular every time I’ve dived there. Wayan and I were the only divers out front and had the IMAX fishbowl to ourselves – incredible! And as quickly as it began, it was over – one minute the sea was full of fish, the next empty. Further north of Gili Lawa Laut is the still active volcano of Sangeang. There are several sites here, all of which are similar in topography – colourful reefs juxtaposed against the black volcanic sand slopes which still give off sulphuric bubbles from the magma churning deep below the earth’s crust. Diving on Bubble Reef, Black Magic and Tikno Reef sites proved to be a riot of colour and different critters, especially this vivid orange frogfish that lurked within the soft coral fronds of Tikno Reef. Bad weather stopped us diving more of sangeang the following day – we had a near zero visibility dive at Bontoh, so were glad to head for Gili Banta and the dive sites of Highway to Heaven and K2. It was the It’s A Small World night dive at Gili Banta, the last night dive of the trip, which was particularly great, especially as we managed to find the Stargazers that wait almost wholly buried in the sand waiting for their prey. The final two days of our trip involved only two dives each day as we needed to do some hefty cruising to make it back to Maumere on schedule. It was a shame we coudn’t squeeze in a third dive on our penultimate day. The two dives we did at Sabolan in the morning were good fun and had great viz, with some good coral growth too, although not a huge amount of fish life, except for the crocodile fish we discovered towards the end of one of the dives. Our final dives at Palau Raja, by contrast, were an unexpected treat – this is a site rarely dived and is named “School House” as you can see the kids heading to their wooden school building on the shore directly in front of the dive site. Despite the presence of fish traps and the evidence of old dynamite bombing, what I thought at first would be a mediocre site turned out to be beautiful. Once we’d headed through the slightly bashed up shallows, there was a steep drop off at around 8 metres that revealed a vertical wall encrusted with massive fan, barrel and plate corals, one of which could have easily swallowed a diver. In conclusion, seeing Komodo for a third time has only made me want to go back and dive it again. The sheer variety of sites that you see within a 10 day trip – from the temperate waters of Cannibal Rock to the warm tropical waters of Sangeang – makes it a truly unique area for diving. You get the best of both worlds here, with big stuff – manta rays and en masse fish action – as well as a plethora of amazing small stuff too. There is also the sense of being on an epic voyage thanks to seeing the Komodo Dragons themselves but also the desolate and beautiful topside scenery too. And despite Komodo being a popular destination, you rarely see any other boats – we saw one Japanese boat of divers at Cannibal Rock and that was the only time divers were in the water at the same time as us. The huge diversity of the area means that as an introduction to Indonesia diving, Komodo is hard to beat.